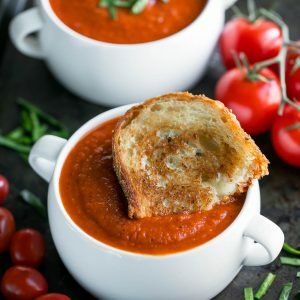 Instant Pot Tomato Soup is an easy peasy twist on a comfort food classic! The IP locks in flavor and gives this vegetarian soup a slow-simmered taste in a fraction of the time. Love it so! Last week I tweaked my classic Fire-Roasted Tomato Soup a bit and tested it out in the Instant Pot. The results were *delicious* and I loved that I could just toss the IP pot in the dish-washer when I was done. It was so easy and, after a quick little sauté of the onions for extra flavor, so hands off! The leftovers can be frozen (WOOT!) and it’s a great make-ahead option for those of you who like to meal prep. It tastes fantastic the next day (and the day after that!) and is perfect “fast food” when you need to be warmed up on a chilly day. Snag a bowl to reheat at your desk at work or simply snuggle up at home after a long day with a speedy dinner. served alongside a leafy green salad or a side of roasted veggies. No Instant Pot? No problem! I’ll include stove-top instructions below the recipe card. As written the soup is gloriously vegetarian, vegan, and gluten-free. It’s technically paleo and whole30 friendly too and can be made with chicken broth if preferred. Just ignore those melty grilled cheese photos, lol. The toppings and mix-ins are where you can have a little bit of fun based on diet and preferences (just choose what works for you!) so feel free to mix things up a bit and add what works for you! If you’re jonesin’ for a creamy tomato soup, I’ll include a few dairy options for ya too. We’ve tried this scrumptious soup with cream and also with cream cheese and have basically swooned over the results! This easy peasy Instant Pot Tomato Soup serves 4. The leftovers are amazing so feel free to incorporate this soup into your meal planning and meal-prep routine or even freeze a bowl for a rainy day! 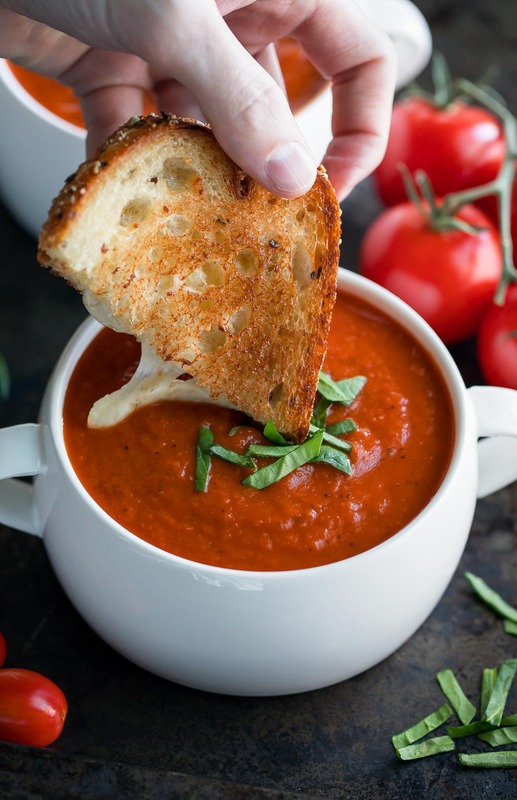 Instant Pot Tomato Soup is an easy peasy twist on a comfort food classic! The IP locks in flavor and gives this vegetarian soup a slow-simmered taste in a fraction of the time. Switch your pressure cooker to the SAUTE function and sauté onion in 1 TBSP oil for 3-5 minutes, until edges are golden and tender. Add garlic at very end and cook 30 seconds more while stirring. Add chopped carrots, seasoning (salt, pepper, oregano, basil, and optional sugar) along with canned tomatoes and tomato paste. Set to HIGH pressure for 15 minutes and allow to come to pressure, allowing a natural pressure release for about 10 minutes. Use a hand held immersion blender to puree until fabulously smooth. You can also blend the soup, in two batches, in your blender or food processor. Lastly, give the soup a taste and adjust broth/tomato/seasoning to taste, adding any extra of whatever you prefer to get your ideal thickness and flavor. Additional broth can be added for a thinner soup and 3-4 ounces of cream cheese or heavy cream can be added (after cooking) for a creamy soup. Simply add extra spices to compensate for any additions and taste as you go. Easy peasy! Serve piping hot with a melty grilled cheese sandwich and enjoy! Craving a creamy tomato soup? AFTER pressure cooking, simply add 2-3 oz of cream cheese or 1/4-1/2 cup of heavy cream and blend into soup until smooth and creamy. For vegan mix-ins, try your favorite cashew cream or even a little coconut milk. Nutrition Facts below are an estimate gathered using an online recipe nutrition calculator. Adjust as needed and enjoy! If you get a chance to try this easy peasy Instant Pot Tomato Soup, let me know! Leave some love in the comment form below or tag your photos with @peasandcrayons on Instagram so I can happy dance over your creation! I can’t wait to see what you whip up! Sauté onions and carrots in 1-2 TBSP olive oil until tender. Next add garlic and cook for an additional 30 sec until fragrant. Add tomato paste and cook until toasted, approx. 1 minute. Next, add tomatoes, broth, and bail and let simmer for 25 minutes, until the vegetables are tender and the flavors have melded together. Lastly, give the soup a taste and adjust broth/tomato/seasoning to taste, adding any extra of whatever you prefer to get your ideal thickness and flavor. Add the optional sugar to cut the acidity if needed. Additional broth can be added for a thinner soup and 3-4 ounces of cream cheese or heavy cream can be added for a creamy soup. Simply add extra spices to compensate for any additions and taste as you go. Easy peasy! Garnish with basil and dive in while it’s hot! 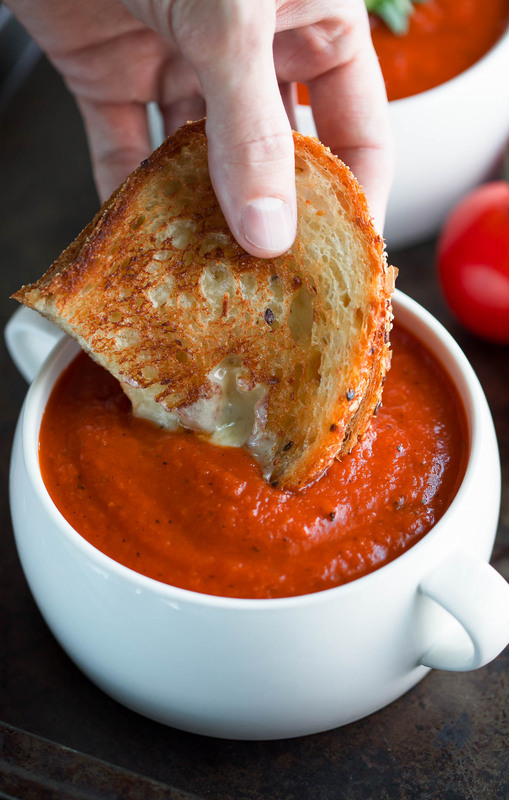 Brie Grilled Cheese – perfect for dunking in this tomato soup! This soup is so delicious, seriously. Perfect texture, nice and creamy, and all I added was salt. And what makes it even more amazing is that it really is as easy as throwing it all in the instant pot and letting it do its thing. It has officially hit the regular rotation list!! 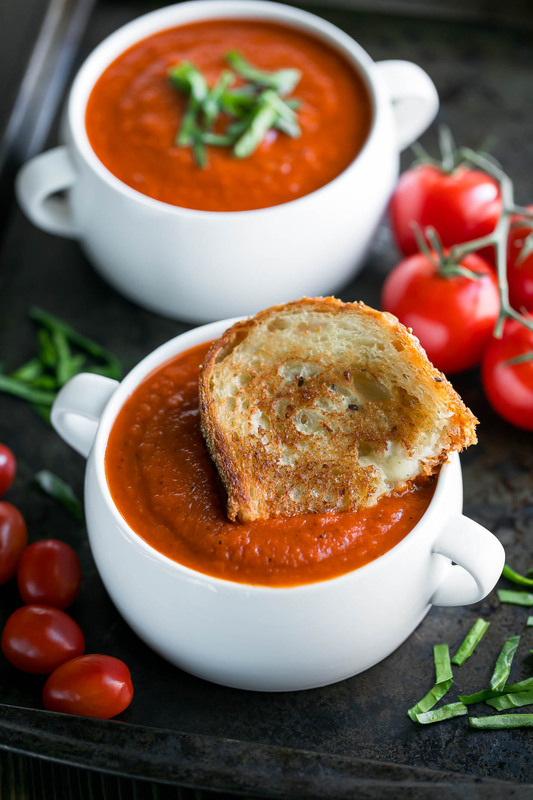 This is an excellent tomato soup and very easy! Oh Jenn! This was absolutely delicious! I’ll be making this often. Just wanted to say how awesome it is that you included the Vegan option. That is how I’m going to make it today. Thanks so much!! This is delicious! Nice and thick, even with adding additional vegetable broth. The few ounces of heavy cream was a nice touch too. WOOT! Thank you Debbie! Super happy to hear it! This is so delicious and quick. Loved making it and will try again soon. 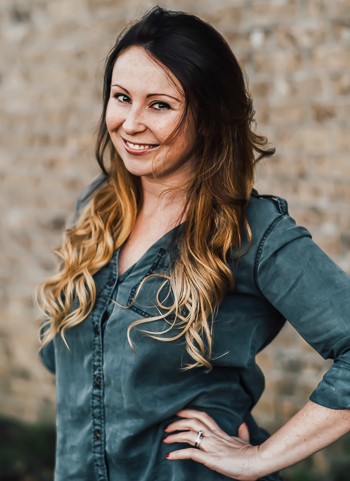 So so glad you enjoyed it Molly – thanks! Tomato soup is a favorite this time of year! Great recipe! I could seriously eat it daily right now with this cold gloomy weather!